It’s been called the most successful hobby shop promotion of all time by longtime industry experts. It’s made hobby shops across North America bona fide post-Thanksgiving retail destinations. It’s delivered some of the most unique and sought after trading cards in recent years. And next week it’s making its triumphant return. 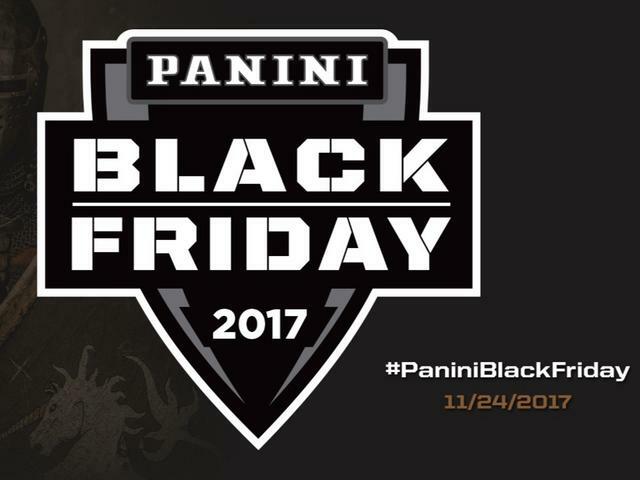 News flash: Panini America’s 2017 Black Friday promotion is coming. to local hobby shops all over the country with another of its now-legendary wrapper-redemption programs. including preview galleries, participating shop information, iCollectPanini.com components and more. and the traditional multisport set that includes athletes from the worlds of basketball, baseball, soccer and NASCAR. to 50 (Decoys and Wedges), 25 (Cracked Ice), 10 (Rapture) and one (Hyperplaid). and parallels coming to this year’s 2017 Black Friday sets. and many more surprises that will be revealed in the coming days. 2017 Panini Black Friday brings back the popular hobby shop promotion for another go. This means a wide variety of exclusive cards, not to mention crowds and community at your local hobby shop. And being around card collectors is probably more fun than fighting it out for TVs and Hatchimals at your local Walmart. Once again, 2017 Panini Black Friday has two separate but similar sets. One is solely football. The other combines the remaining sports in Panini’s portfolio. et exclusive cards for free through the 2017 Panini Black Friday packs. during the post-Thanksgiving retail extravaganza. while the multi-sport packs combine other key choices in one group, including baseball, basketball and racing. This was also the case for 2016 Black Friday. The 2017 Panini Black Friday Football base set comes with 75 cards. Twenty-five rookies are serial-numbered to 399 copies. On top of those are a variety of parallels numbered to a high of 50 all the way down to one-of-one. Panini makes it a tradition of using some non-traditional pieces of memorabilia in their promo sets. Once again, that means things like towels and the player-worn Santa hats found in Happy Holidays. Also back are Super Bowl Memorabilia cards. These come with pieces of Super Bowl LI footballs and pylons embedded in them. Ideal for those who gravitate to NFL sets, the 2017 Panini Black Friday Football checklist features 75 base cards. with top stars of the league. There are also low-numbered parallels, limited to 50, 25, 10 or one-of-one. In addition, many cards should have autograph versions. in Happy Holidays and Salute to Service. 2017 Panini Black Friday Multi-Sport packs include athletes from baseball, basketball, NASCAR and soccer. The make-up is similar to the football-only set, starting with the 75-card base set. Once again, 25 rookies have 399 copies each. Parallels come in a variety of forms, numbered to 50, 25, 10 and 1/1. The inserts and bonus cards are also a different spin on football sets. in other sports and more. There’s also Headbands, with player-worn pieces of headgear. This isn’t the only hobby shop promotion in November, either. Topps has a separate holiday promo set available a week earlier, starting November 17.
to the standouts of MLB, NBA, international soccer, and NASCAR. A 75-card base set with 25 rookies (#/399) is in effect here, as well, with parallels also limited to 50 or less. via Rookie Headbands, Rookie Memorabilia, Tools of the Trade Jumbo, and the themed Happy Holidays cards. International Soccer Stars and MORE! - Loaded with Autographs, Unique Memorabilia and various levels of Sequentially Numbered Parallels!! - Parallels #’d to 50, 25, 10 & 1!! - And much . . much . . more! - Brick-and-Mortar Store Promotion ONLY! (per box/per case). Click on the link for specific product pricing. and to verify how the 2017 Panini Black Friday packs will be awarded. Enjoy the imagery and stay tuned to The Knight’s Lance for continued coverage of 2017 Black Friday. Dernière modification par Eyeshield21 le 16 mars 2019, 11:42, modifié 4 fois. Les reg sont absolument superbes! olajuwon a écrit : Les reg sont absolument superbes! and true traditions that bring us joy, rekindle fond memories and make our seasonal celebrations so special every single time. So it is with Panini America’s annual Black Friday set. about the nontraditional memorabilia cards that have become a bona fide Black Friday tradition. from the worlds of basketball, baseball, soccer and NASCAR. in time for the holidays and much more. for the oversized Tools of the Trade cards or the Salute to Service and Santa Hat inserts. of the set’s base and parallel cards. We’ll follow up soon on The Knight’s Lance with a preview gallery devoted exclusively to the 2017 Black Friday set’s autograph inclusions. Until then, enjoy . . .
Dernière modification par Eyeshield21 le 16 mars 2019, 11:42, modifié 1 fois. a set of eyeballs, a set of ears or a flurry of mouse-button clicks. But nowhere are the signs of Black Friday more exciting than in the gallery below. Actually, make that the signatures of Black Friday. legends and rookies from the worlds of baseball, basketball, football, NASCAR and soccer. magical black-foiled Black Friday packs. Kobe Bryant. Stephen Curry. Aaron Judge. Pelé. Cristiano Ronaldo. Christian Pulisic. Ken Griffey Jr. Lonzo Ball. They’re all featured on the 2017 Black Friday autograph checklist — and that’s just the short list. There are plenty more featured in the must-see gallery below. of the 2017 Black Friday promotion.